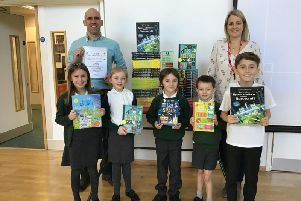 A group of pupils from a Hassocks school were treated to an afternoon of professional storytelling. Ross Montgomery, a children’s author, travelled to The Windmills Junior School, to amuse the pupils with a story for National Storytelling Week. The event was organised by residential property developers Barratt Homes. The society sees a story as the traditional medium of communication from generation to generation, a tool for expression and can be enjoyed by everyone. Lynnette St-Quintin, sales director for Barratt Homes, said: “We were happy to support National Storytelling Week again this year. Head teacher, Leila Murray, at The Windmills Junior School said: “The children had a great time. “Storytelling awakens children’s’ imaginations and it has been an incredible treat for them. Professional storyteller, Ross said: “There is nothing better than being transported into another world with a great story. The storytelling activity took place as part of the Barratt Homes education programme thanks to the housebuilder building homes at the nearby Saxon Mills development. Ross Montgomery is a first-time author. He started writing stories as a teenager, when he really should have been doing homework, and continued doing so at university. After graduating, he experimented with working as a pig farmer and a postman before deciding to channel these skills into teaching at a primary school. He wrote Alex, the Dog and the Unopenable Door when he really should have been marking homework. This debut book, was nominated for the Costa Children’s Book of the Year and the Branford Boase Award, and selected as one of The Sunday Times’ Top 100 Modern Children’s Classics.